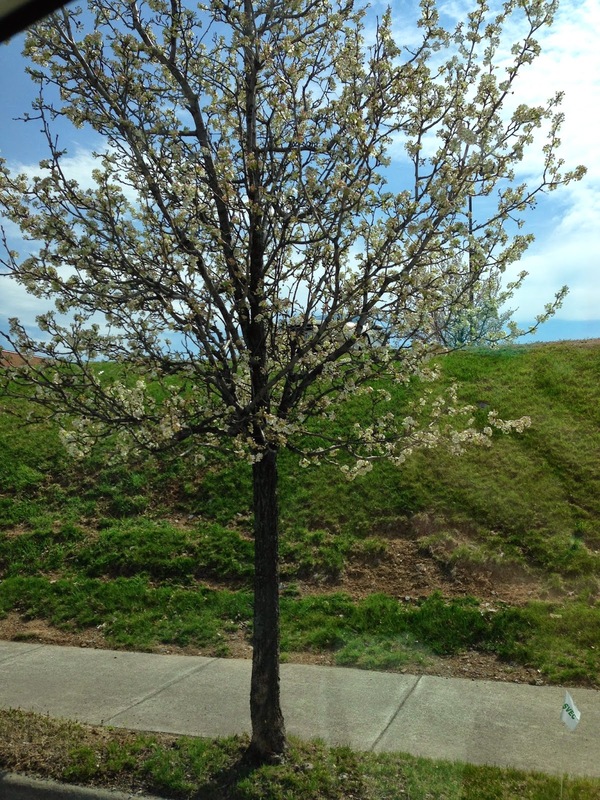 The tree above was one of several in a shopping mall near Winchester, Virginia. I couldn’t get a good shot of all the trees, so just posted this one. Winchester is a medium size city with a small town flavor. I loved the history, the small, narrow streets.. lots going on and I can see why my cousins chose this as there home. Its too busy for me… the traffic never goes to bed, if you know what I mean, but northern Virginia is on rolling hills of beauty. My time with my cousin Rich and his wife has been short, or it seems so. Busy, busy people. They told me this was an exceptionally busy time, but I would be gone by the time they got back to “normal” whatever that is in their lives. 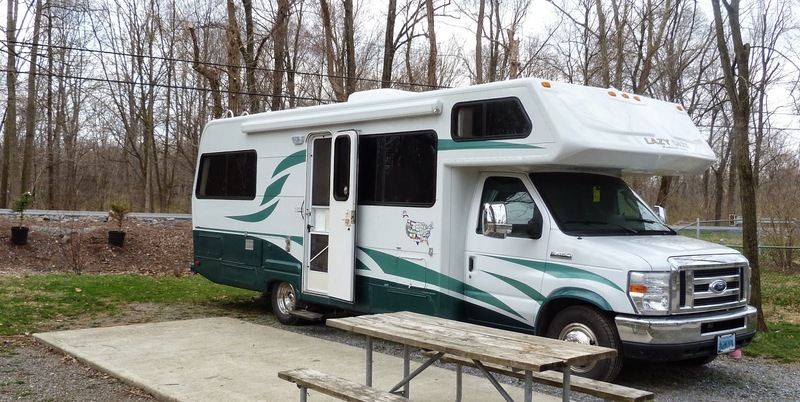 Rich asked me all kinds of questions about going RVing… he was given several links, plus a note from Tessa, another Lazy Daze person, who traveled extensively with her kids. They were most appreciative of all the info. The kids were great to spend time with as well. All and all, I won’t wait 24 years to see them again… Thanks for a great time Rich, Bonnie, Dean, Becca & Sammi. Loved my time with you. The day before I left Winchester, another Lazy Daze couple knocked on my door. This time it was Barry & Mary Ellen from MA. They also know Ted & Liz that I met in NM. What a delightful start for my day, thank you! Love my Lazy Daze family. Sure have missed them this winter. In my quest to move north – for the longest time, weather was the culprit of restraining my advancement. Now a new restraint as reared itself. When I left northern VA, I knew that a KOA was open off of I-81 and only a State Park would open on April 15th. Nothing else. Did you read that – I said, NOTHING else. Oh sure, I could stay at truck stops (one night only), might even be able to do a night in a rest area (don’t want to). . So I decided to do the slow poke method. Stop at Falling Waters in West Virginia to get that state logo, then stop at Yogi Bear in Maryland for another night or two (these two places are less then 50 miles from Winchester)… do a truck stop or two until I reached Locust Lake State park on the 15th of April. Well… I stopped at Falling Waters and left (not a place I will stay overnight). Totally missed Maryland, due to heavy volume of traffic, and now I’m in Pennsylvania at one expensive KOA, as the State park is not open yet – no place else to park it. I have scoured Ultimate Campgrounds app, etc – nothing opens until May 1st. I’m stuck. Not a happy camper either. When I get to Wilkes Barre, there’s a casino with overnight parking, yet that is only for one night. Nothing in NY is open until May 1st either. No driveway has been offered to park, nothing… Today, I discovered the Locust Lake SP does not have laundry facilities…. so may not hang there very long, but where else to go? The roads are heavy with RV traffic right now… but its Canadians heading home, New Englanders heading to their homes… I will just have to bide my time. So the following pictures are at the KOA in Jonestown, Pennsylvania. Just the name Jonestown invokes a memory I prefer not to remember… but I am here, so will make the best of it. Directly behind my rig and to the left in the picture is the highway. Could they get me a little closer? It was a hot weekend (88ºF) and all the motorcycles were out in force on this highway. Got the impression this was there first warm day since last summer. No option given for me to park back in here. Was surprised to see that I was real close to right edge of this bridge. Lots of folks walking behind my rig with fishing poles, etc. Had a option to park next to the creek/river, but it would have cost me more, so they stuck me next to the road instead at $44/night and no weekly rate. OK grumpy’s are gone now, it is what it is and I will just deal with it. As I do with everything else. All is well. I got to get the rig ready for the drop in temperatures tonight. Snow is coming in! Sigh… It has been too warm to close up until now. Been raining since the wee hours… no thunder tho. Winds just picked up and is really rocking the RV. Ok, got the vents closed. Got the Reflectix up on the door, got the Reflectix out to put in kitchen window after I finish this blog. Need to put the blanket up to block the cab, finish my dishes, insulated my one and only plant. And just remembered I had tossed the reflectix for the bathroom window… darn. Will jerry-rig something for that. Doubt I will need the rest of my winter prep… its not going to be cold for long. I know, I know…but after all these 80+ temps, I’m looking forward to having some cooler weather coming in. Laughing here. Kansas is pretty nice one day warm and windy next day cool and windy strange spring not sure what summer will be. You have all kinds of weather this winter and spring in your travels thats for sure hope things get better for you. This crazy weather is happening everywhere, can't help but experience it. One of the nice things about traveling in a RV – you don't have to stay where its nasty, you can leave it behind or ride it out. Wish I knew somebody in PA with a driveway, but I don't. I am back home in Sequim, WA where it might rain every now and then, but it's comfortably in the 60s, grass is growing like mad, daffodils all over the place, and my tree peonies and lilacs will bloom soon. How is the weaving coming along?